The personae in Arthur Yap's poetry are often standing still, immobilized and yet moved to contemplation. The often-unnamed settings in his poems frequently receive a second or third mental visitation, as if inviting us to explore the treatment of the spaces and places of his poetry. This essay takes up Yap's poetic invitation while at the same time approaching Yap's poetry from a critical as well as pedagogical perspective. The first part of the essay deals with the initial frustrations and difficulties of reading Yap's poems, which are often solipsistic and reflexive, as if refusing to engage with social reality and hence not always amenable to a reading that probes for their engagement with social and cultural issues. As a reader, writer, and teacher of poetry and literary criticism, I draw on my personal encounters with Yap's writing in order to illustrate the uniqueness of his style and illuminate the nuances of his verse. The second part of the essay draws on basic concepts of urban and cultural geography to enable an examination of spaces and places in Yap's poetry. The last part of this essay looks at Yap's poetry through general insights offered by Henri Lefebvre in his book The Production of Space and more recent and specific scholarship on the relationship between space and history in Singapore. These provide a useful starting point for understanding how Yap maps a variety of spaces and critiques spatial practices in Singapore. I first encountered Arthur Yap's poetry alongside those of Edwin Thumboo and Lee Tzu Pheng as an undergraduate at the National University of Singapore. Unsurprisingly, I was frustrated by Yap's poems; unlike other poems such as Thumboo's “Ulysses by the Merlion” that cements the relationship between poetry and nation building and Lee's “My Country and My People” that is wary of being co-opted by patriotic discourse, Yap's verse seems hesitant about saying anything in this regard. Yap's poems read frequently like arrested departures; they are often negations of the past without any promise of a movement into the present or future. Despite Arthur Yap's disavowal that there is any symbiotic relationship between his painting and poetry, the similarities between his visual canvases and his written verse are palpably obvious. In an essay about the relationship between poetry and painting, Wallace Stevens (1951) points out that “often a detail, a propos or remark, in respect to painting, applies also to poetry” (p. 160). Stevens elaborates on the parallels between the two practices and concludes that “it would be possible to study poetry by studying painting, or that one could become a painter after one had become a poet, not to speak of carrying on in both métiers at once, with the economy of genius, as Blake did” (p. 160). Stevens’ proposition takes Horace's ut pictura poesis (“as is painting, so is poetry”) a step further. Not only are the processes of poetry similar to those governing painting, a similar aesthetic reflex also binds commentaries on art and poetry. Stevens’ formulation is especially pertinent in the case of dual practitioners — poets who paint or painters who write poetry. With William Blake, Paul Klee, D.H. Lawrence, Hermann Hesse and David Jones, poetry and art are bound by the same aesthetic and thematic concerns, fed by a common pool of impulses and obsessions. Indeed the reciprocity or crossfertilization between poetry and painting is a key Modernist impulse that is well-documented. William Carlos Williams, Ezra Pound, Gertrude Stein, Paul Eluard and Wallace Stevens all drew inspiration from their artistcounterparts in the quest for new poetic modes and themes, often looking to art for what cannot be expressed in words, while Wassily Kandinsky, Pablo Picasso and Paul Klee aspired to the lyricism of colour, voice, and form that they found in poetry. In the case of poet-painters, art and poetry complement, reinvigorate and reinforce each other. Arthur Yap, as a poet and painter, inherited this Modernist alliance of art and poetry, which can be seen most clearly in his predilection for abstraction in both his paintings and his verse. There are few truly ekphrastic poems in his oeuvre, by which I mean poems that respond to particular paintings; neither are there poems about painters or poems consciously advocating any aesthetic school or movement. But there is a substantial body of poems that mediates between art and poetry, conducting lyric meditations on the aesthetics of perception and compositional issues, exploring the relationship between seeing and making. Like William Butler Yeats and Gertrude Stein, Arthur Yap, whose work is also regarded as modernist in theme and style, expressed a fascination with things. For W.B. Yeats, in his famous poem “The Second Coming”, it seems as if all things — social norms, cultural values, political aspirations — associated with European civilization had fallen apart and were ruined in the wake of World War I, as seen in the apocalpytic tenor of the oft-quoted line “Things fall apart; the centre cannot hold” (1956, p. 184). Gertrude Stein, on the other hand, offers a more optimistic outlook on things, claiming that “[c]ontinuous present is one thing and beginning again and again is another thing. These are both things. And then there is using everything” (2004, p. 25); Stein's compositional craft takes up everything around oneself as suitable material for the poetic imagination. And then there is Arthur Yap, whose treatment of things expresses a sympathetic yet critical sensibility, observing how “some things remain / some things pass, / some things are tired” (The Space of City Trees, 2004, hereafter Space, p. 4), and pointing to how we are often caught up in “a habit by which the world moves” such that “people will not look at the centre of things” (p. 78). In his poetry Yap personifies things, calmly observing how they come, go, or grow weary; at the same time, he calls things out to us, drawing our attention to our habitual distraction and unwillingness to look closely at them. And perhaps, Yap suggests, this unwillingness or inability to pay close attention stems from the way in which Singaporeans have grown used to treating what they have around them as objects rather than as things. This chapter argues that Arthur Yap's poems take a “thing-like” approach towards the landscape, people, and bits and pieces of everyday life that make up Singaporean society after the country's independence in 1965. By a thing-like approach, I mean that Yap's poetry actively transforms what we would normally think of as common and functional objects with a set or defined utility into strange and multifaceted things. The representation of things in contemporary literature and culture is a subject on which literary and cultural critic Bill Brown has written at length. In this chapter we analyse Arthur Yap's short stories in two distinct segments: his early prose fiction written and published between 1962 and 1964, and his later stories from the period 1969–82. At first glance Yap's stories may appear slight, even undynamic. However, as careful readings of his sparse, understated poetry and visual art reveal, in Yap's works things are rarely as they initially appear. Through close readings of his short stories — so short we suspect almost every word takes on the metaphorical pressure per square inch we might expect in a poem — we demonstrate how these works repay closer scrutiny and merit a more prominent place in Yap's collected works. In many of his poems performative wordplay is overt; while in his short, often sparse, poems there is little room to subtly embed such performances, Yap's comparatively longer prose fiction provides scope for significantly more subtle and ambiguous linguistic performances. Beneath their quotidian surface, Yap's beguiling short stories are as rich and as enigmatic as his poems. Yap's poetry is more representational than his painting and his stories appear at first glance even more representational than his poetry. On a cursory reading there appears to be little of the explicit absence of conventional grammar or overt linguistic exhibitionism we encounter in his poems. Yet those same spare, crafted poems engaging with the everyday may prepare readers to be wary of what might initially appear to be a slight, “commonplace” quality to the stories, where little seems to happen. The near absence of event draws Yap's readers’ attention to other elements: specifically a subtly knowing deployment of language (notably in grammatical trickery and the use of telling vocabulary and phrases) contributing to the stories’ ambiguous and, with successive readings, increasingly perplexing nature. As we demonstrate, Yap's stories benefit from wary, active, linguistically and historically sensitive readings. Yap is already recognized as a poet whose voice tentatively locates, satirizes, and subverts an emerging sense of Singaporean nationhood. We explore how the aesthetic and ideological trajectories of Yap's prose in many ways resemble those encountered in his poetry. While providing an initial overview and exploration of Yap's short stories, the essay initiates critical discussion of a neglected facet of his opus, hopefully prompting further exploration of these stories and their place in both Yap's and the wider Singaporean canon. Arthur Yap was predisposed to silences. I had only ever spoken to him twice in my life, but we had been writing letters back and forth until a year before he passed away on 19 June 2006 of nasopharyngeal carcinoma. Standing before his coffin at his funeral, I could not believe that the poet who had befriended me and encouraged me to keep publishing my own poems was really gone. Gentle and soft-spoken in real life, his reticence had not been a consequence of indifference. I always believed that his silences stemmed from a desire to reserve quick judgment, an inclination that informs his poetry as well. I have tended to equate his general sense of restraint with kindness. In his poems, this quality of restraint opens up a spectrum of conflicting interpretations; the poet is like a quiet but generous host who has invited a whole range of readers to wander and settle comfortably inside the spacious house of his poetry. Kindness was probably not what literary commentators had in mind when they underscored Yap's “private sensibility” (Singh 1999, p. 15) and his refusal to engage with nation-building discourses in outrightly opinionated and political ways in the poems. During an interview, Yap had once answered “no” to a question about whether he was in sympathy with the opinion of Edwin Thumboo, a poet regularly regarded as a literary pioneer in Singapore, that “the writer must explain his society, bring into focus the forces, whether healthy or pernicious, which move society” (quoted in Wong 2009). Yap seemed to express views that emanated from a temperament that was clearly not comfortable or convinced by the call for poets to take a public role on issues such as the formation of a national identity. In an earlier essay of mine, I made a case for the claim that the great majority of poems in Yap's oeuvre confront social discourses through an unwavering position of uncertainty and scepticism, in which contradictory attitudes are often juxtaposed and left without one winning out over the other. Hovering between a conscious and an involuntary response across a range of implied or explicit attitudes ranging from uncertainty, through ambivalence and ambiguity, Yap's sense of a Keatsian negative capability is bounded to a position of liminality that runs counter to any straightforward critique or analysis of socio-political concerns. Arthur Yap's poems which portray the human condition and the environment through everyday scenes in public spaces demand an interpretation that radically challenges the anthropocentrism and nature-vs.-culture dualism of Western classical humanism. Nature is a prominent presence in some of Yap's poems, and conspicuously absent in others. Both its presence and absence are intertwined with the human sociocultural environment shaped by historical forces. Underlying this relationship is an ecological perspective that informs the subject matter and poetics of Yap's poetry, which can be considered “ecopoetry” to a certain extent. Although Yap's work shares ecopoetry's ecological awareness and concern with environmental issues, it refuses to be confined to any narrow definition of ecopoetry as “a new brand of nature poetry” (Bryson 2002, p. 3). This is the case partly because of its subversive postcolonial mimicry of Eurocentric perspectives on the human/nature relationship, and partly because of its central concern with daily urban life. While the characteristics of ecopoetry as described by American and British critics can shed some light on Yap's poems and poetics, they are inadequate for a fuller understanding of Yap's thematic concerns with the relationship between nature and culture, which are significantly different from those of the British and American nature poets whose work some critics consider early ecopoetry. In his definition of “ecopoetry”, J. Scott Bryson traces “the history of nature poetry … back to the roots” of the English language, from Beowulf to Blake, to English Romantic poetry, and eventually to “a new form of nature poetry” produced by “antiromantics” such as Robert Frost, Robinson Jeffers, and Wallace Stevens, among others (2002, p. 2). Bryson's definition of “ecopoetry” draws on Robert Langbaum's discussion of a paradigm shift in twentieth-century poetry from traditional “nature poetry” largely as a result of scientific discoveries such as those in evolution and geology (p. 2). According to Langbaum, “the best twentieth-century nature poetry ‘defines itself precisely by opposing, or seeming to oppose, the pathetic fallacy …’ which characterizes overly romantic nature poetry” (quoted in Bryson 2002, pp. 2–3). In the poems of twentieth-century antiromantics, Langbaum maintains, one feels “in nature an unalterably alien, even an unfeeling, existence”, thus carrying “empathy several steps farther than did the nineteenth-century poets who felt in nature a life different from but compatible with ours” (quoted in Bryson, p. 3). Chances are if you are reading this book, you have already been introduced to Arthur Yap and his work through one of the numerous anthologies of Singaporean poetry and writing, or by way of several critical sourcebooks on Southeast Asian or Singaporean literature in English. Yap's consistent presence in these anthologies and collections suggests that he is an important and influential figure in both national as well as regional Englishlanguage literary landscapes, and it is regrettable that, unlike some of his contemporaries, no one volume was dedicated to his multifaceted creative output during his lifetime. The present collection of essays addresses this critical lack by gathering new and innovative work on Yap's prose, poetry, and painting written by an international group of scholars and critics. This introduction briefly summarizes the critical reception of his work and then discusses it in terms of three discursive modes of analysis, or literary and textual methods of examining our lived experience and living environment, both in specific terms of Singapore's history, society, and culture and in more general terms of modern life's concerns and predicaments. 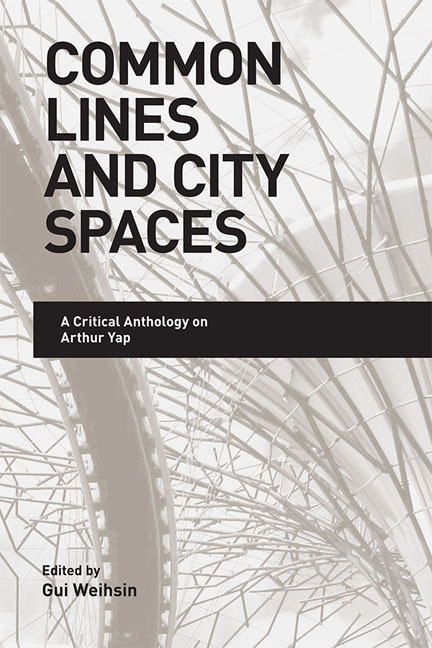 Some of our contributors examine, with renewed emphasis, important topics in Arthur Yap's writing that have been the subject of earlier critical essays, such as his erudite wordplay and laconic voice, his apparently reserved and ambivalent attitude towards social and national issues, and his thoughtful treatment of urban space and the cityscape of modern Singapore. In addition, this collection also includes essays that shed new light on Yap's literary transformation of mundane objects into multifaceted things; the connection between his verse and the natural environment as a nascent form of ecopoetry; the powerful stillness and silence in his paintings that resonate with his laconic poetic persona; the desire and affection expressed in his mapping of the queer spaces of the city and in the sheer sensuousness of his travel poems; and the social and cultural commentary of his short stories, which have never before been critically examined. It is hoped that the essays included here will pave new ground for future scholarship on Yap's work in different genres and media, such as his paintings and their exhibition at international venues, his rare but dazzling pieces of short fiction, as well as his own linguistic and literary criticism. Especially during his later years, Arthur Yap was generally regarded as a private and reclusive figure who kept out of both the public eye and Singapore's literary scene. Indeed, criticism about Arthur Yap's poetry often contends that his poems are more concerned with a general human subjectivity existing in an anonymous, modern urban space rather than with specific particulars of Singaporean society or history. In contrast to this prevailing view of Yap's writing, this chapter focuses on his direct engagement with and literary explorations of Singaporean local spaces that show us an active and democratizing engagement with everyday life in Singapore. I argue that Yap frequently utilizes encounters with such spaces to map moments in Singapore's social and cultural history, and to explore a complex relationship with personal and national memory in ways markedly different from other local poets of his generation. Yap's allusions to local space are therefore of special significance, given that in much of his verse he pares poetry down to its bare essentials, favours understatement, and only makes rare but precise references to identifiable places in Singapore. Much of my exploration of Yap's engagement with local space and time will be interdisciplinary. While drawing upon both art history and local topography, my investigation is also informed by a critical tradition hitherto rarely referred to in discussions of Yap's work: historicism. For reasons of perceived political and pedagogical expedience, Singaporean literary criticism has until recently remained highly influenced by the traditionally hermeneutic, textually focused critical schools of New Criticism and Formalism. As a consequence the idea of the poem as an autotelic or selfenclosed artwork prevails in Singapore. In his own country therefore Yap is predominantly characterized as an almost self-effacing poet who is constantly making large, generic, and universal points that transcend the specificities of local culture and society. Yet, at the same time, Yap's work is often characterized by its ambiguity and ambivalence. These qualities might suggest that we too, as reader-viewers of Yap's work, need to exercise caution and probe the ambivalence surrounding the poet's self-effacement of his biography and background. In a significant number of poems Yap offers tantalizing glimpses of concrete and specific geographical, historical, and cultural particulars that invite readers to reflect on the implications of these details. Although considered to be one of the jewels of Further India, Cambodia has been influenced by China in a variety of ways: through Chinese immigration and the spread of techniques as well as in a way that can broadly be described as “cultural”. Naturally, the Cambodian language has recorded this penetration, for example by absorbing several hundreds of words of Chinese origin. One would therefore expect to find the stamp of a similar influence upon Cambodian literature. Yet, paradoxically, this influence on classical literature can barely be perceived through “hints and guesses”. For, although they are clearly discernible in the Cambodian texts, the themes of the Chinese merchant and of Chinese political power appear to reflect social and political realities rather than trends in inspiration or literary sensibility. Given the state of research on the subject today, the traces of Chinese literary influence, if indeed they must be sought, can only be found either in a handful of little-known manuscripts dating from not earlier than the mid-nineteenth century, or else in a regional (in a sense, foreign)and short-lived genre of popular theatre that sprang up a few decades later. In fact, it is only in the 1960s that the Chinese influence can unmistakably be seen to be direct, explicit and meaningful. This influence was then all the more palpable as it was found in popular-priced books, serialized novels and comics, that is to say, in literature of the liveliest and most widely read variety. Moreover, in contrast to the meagreness in the number of “Chinese-inspired” works published in earlier times, the output of the sixties was abundant and varied, and increasingly well received. Yet, and here is another paradox, specialists of contemporary Cambodian literature have rather ignored this class of literature while paying attention, for example, to the products of the French influence on Cambodian literature. Our purpose here, therefore, is to return to the question by summing up what is known about the contribution of the Chinese influence to the development of Cambodian literature. We shall first describe the situation in the nineteenth century, then pinpoint the emergence of a Chinese-inspired literature during the first half of the twentieth century, and finally examine the contemporary wave of Chinese influence. From the time of King Rama I to King Rama V (1782–1910). From the time of King Rama VI to King Rama VIII (1910–46). From the time of the present reign up to now. In the first period, the Chinese literary works that were translated into Thai were mainly historical romances. There are altogether thirty translations done from the time of King Rama I to the time of King Rama V. The very first translation from Chinese is “The Romance of the Three Kingdoms” which was translated in the reign of King Rama I. The translation of Chinese historical romances into Thai in the reign of King Rama I to King Rama III were all done under royal patronage, while those translated in the reign of King Rama IV and V were under the patronage of high-ranking royal officials. In the second period, translations from Chinese were those of historical stories and novels, and they were done under the patronage of the owners of publishing houses or newspaper editors. Translations of Chinese historical novels were first published in series in Thai newspapers in 1921 and were very popular among the readers. Some newspapers such as Srikrung published at least one series or sometimes three in every issue. When Thailand got involved in the Second World War, the newspapers were closed down, and that was also the end of the translations from Chinese novels published in these newspapers. In the third period, translations from Chinese works were no longer historical stories only. Translators who knew English started translating works of Chinese that were already translated into English or works written by Western writers about China. Pearl S. Buck's works were highly popular among the Thai readers. Thai translations of Buck's works are numerous; for example, The First Wife, The Mother, The Young Revolutionist, East Wind, West Wind, The Good Earth, Big Tooth Yang, etc. Then there were translations of Chinese short stories, such as those of Lin Yutang and some other writers. The most popular among translations from Chinese were those of the wuxia type. Given the paucity of information on the Javanized Peranakan Chinese society, it is rather difficult to provide an outline of the acculturation process of these Chinese families of long standing in Java. We know virtually nothing about the way these descendants of Chinese acquired their knowledge of Javanese Belles-lettres. A brief article by Liem Thian Joe (born in East Java c. 1895, died 1963)says that up to the beginning of this century many Peranakan children, who had been trained in private schools run by Javanese, were familiar with Javanese literature. We can assume that some of them were simultaneously taught Chinese by private teachers and consequently were also able to read texts written in that language as could Tjoa Tjoe Koan (born in Solo in 1861 and died there in 1905). Tjoa declared in 1901 that since 1877 he had enjoyed reading newspapers in Chinese, in Javanese written with aksara, and in Malay written with Latin or Arabic script. He was much concerned with the progress of the Dutch Indies, as well as with that of the Chinese, and in 1903 he decided to found his own printing-works (Tjoa Tjoe Koan Sien Iem Kiok)and launched successively two papers. In a previous study on the literature in Malay by the Chinese of Indonesia we listed no less than 759 translations from the Chinese (not counting reprints)which spanned nearly a century (from the 1870s until the 1960s). For the same period we counted only some 233 Chinese-Malay translations of Western works. The comparison of these two figures proves that the Chinese of Indonesia had in the long run, a deeper interest in the culture of their motherland. If we exclude didactic and religious works, the great majority of these translations consisted of novels and short stories. Since most of these were translated and published in Java where until the 1920s Sundanese and more especially Javanese were still largely used as written and spoken languages, we are confronted here with the question of the spread of Malay language among the urban population of that island, and especially among the Chinese. When the Chinese remain abroad for several generations, without returning to their native land, they frequently cut themselves off from the instructions of the sages; in language, food and dress they imitate the natives and studying foreign books, they do not scruple to become Javanese, when they call themselves Selam (Sit-lam). They then refuse to eat pork and adopt altogether native customs. Having multiplied, in course of time, the Dutch have given them into the hands of a Captain, who superintends this class.